For all things German, the best resource by far is the website Germany in NYC. ART On now at The Morgan, "From Berlin to Broadway: Modern German and Austrian Drawings," taken from the late Broadway lyricist Fred Ebb's collection…From July 29th at MoMA, an exhibition of "Kirchner Street Scenes 1913-1915," the German Expressionist Ernst Ludwig Kirchner's best-known works. 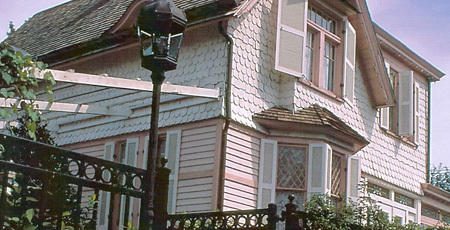 HISTORICAL RESIDENCE In Flushing, the Voelker Orth Museum may not have much of a profile, but it's worth knowing about: Conrad Voelker emigrated from Germany in 1881, and his house was in the family until his granddaughter established the museum in her will. The bird sanctuary and Victorian garden are highlights. MUSIC The Kirov Opera performs the Ring Cycle this month at the Met. Pair that with The Coast of Utopia and you could miss summer altogether. BOOK Whatever you make of the late-in-the-day revelations by Nobel Prize-winning novelist Günter Grass that he was in the Waffen SS, the author may well agree with you, as he argues, after a fashion, in Peeling the Onion. FOOD For your foodstuffs, there's the long-running Schaller and Weber, 1654 2nd [86th] 212.879.3047, and the even longer-running Karl Ehmer in Ridgewood. Koglin Royal Hams, in Grand Central Market, has excellent hams and sausages. RESTAURANTS Even though Hallo Berlin doesn't make a really good currywurst (and we consider that the ultimate test), we still like their restaurant at 626 10th [44th] 212.977.1944, and especially the food cart at 5th and 54th…We can never quite decide if Rolf's, 281 3rd [22nd] 212.477.4750, is worthwhile as kitsch or evidence of a pathology…Hoist a Hefeweizen at Zum Schneider, 107 Ave. C [7th] 212.598.1098 and eat surprisingly well at Loreley. They serve Gaffel Kölsch, the Cologne ale—something you won't find elsewhere…Finally, by our lights, the most echt German you can get is at Zum Stammtisch, 69-46 Myrtle Avenue in Glendale, 718.386.3014. MOVIES A restored print of Fritz Lang's amazing film from 1927 Metropolis screens at Film Forum July 20th-26th.